The Connecticut flag features an ornamental white shield with three grapevines; each bearing three bunches of purple grapes. The vines represent the first English settlements that began to move from Massachusetts in the 1630's. One of the oldest American flags, the Connecticut state flag was originally used during the Revolutionary War when Connecticut troops used the seal on their flag before being officially adopted in 1897. Offered in various sizes Connecticut flags at Tuff Flags are offered in various material choices including premium quality nylon and polyester for all your flag display needs. Be it the heavy duty daily use polyester outdoor flags, the eye pleasing nylon flags that will flutter elegantly even in slow breeze or still the elegant indoor flag kits, we have everything you may need to make your state feel pride. Shop from our complete line of Connecticut Flags right away and get the best prices, quick shipping, and much more! 100% customer satisfaction guaranteed! Our complete line of industrial grade Connecticut flags at Tuff Flags makes perfect symbols of finesse and craftsmanship. Made from premium quality materials, these flags finished with grommets and heading and reinforced with lock stitching are designed to last long even in the most challenging outdoor weather conditions. From the small and handy size of 3’x5’ to the sweeping 8’x12’ our flags are designed keeping in mind your diverse flag flying needs. Need to set up a dazzling display in no time? 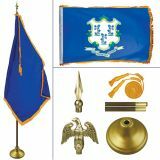 Look no further than our solid oak wood indoor flag kit that comes with everything- right from the gold tassels to the flagpole and ornaments for you to set up an eye catching flag display in no time. 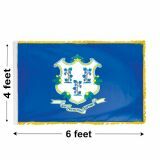 People from Connecticut will find their state flags during any events that celebrate their love for their state at countless other celebrations. Browse our collection Connecticut Flags and choose a model that matches your need. Find it a bit tricky to choose from an overwhelming selection? Call us at our toll free number (888) 287-3524 or email us at customercare@tuffflags.com and we shall be of assistance to you.